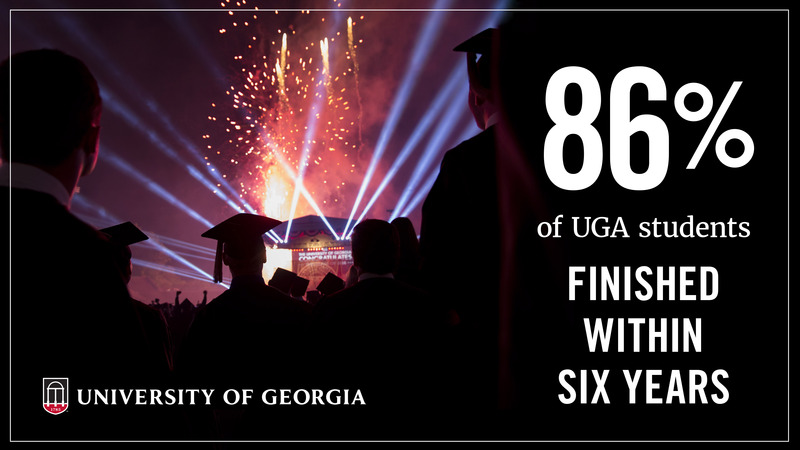 UGA provides a range of programs that promote academic success while building community among students with similar interests and aspirations. Schools and colleges, the Division of Student Affairs, Public Service and Outreach and the Office of Instruction are among the many units that work, often in tandem, to create a learning environment that keeps students on track to graduate while also helping them grow and thrive as individuals. Programs such as the Freshman College Summer Experience, Dawg Camp and the First-Year Odyssey Seminar program lay a strong foundation in the very first year of a student’s college experience. Academic advising, which has been bolstered with increased face-to-face support and new digital tools, helps students navigate their coursework and choice of majors. UGA is the nation’s largest public university to ensure that each of its undergraduate students engages in hands-on learning such as internships, research, study abroad and service-learning. A small class size initiative and a recently completed Investing in the Student Experience hiring initiative have lowered the student-to-faculty ratio and enabled more personalized academic support. This fall the university launched two new Living Learning Communities—one focused on entrepreneurship and another focused on research—that connect students with exclusive learning opportunities, facilities and faculty mentors. In addition, a program known as Double Dawgs gives students more than 150 opportunities to earn both a bachelor’s degree and a master’s degree in five years or less. Recommendations from the university’s Task Force on Student Learning and Success, charged by Morehead, have resulted in an active learning initiative that is promoting higher levels of student engagement and success by transforming traditional classrooms into environments that foster critical thinking, discussion and teamwork. A new program known as ALL Georgia, which also stems from the work of the task force, supports students from rural parts of Georgia with a network of resources and common experiences. It also provides financial aid for six outstanding students from the state’s rural areas per year, for a total of 24 students. Tailored academic and support programs such as these have helped the university jump three spots to No. 13 in the 2019 U.S. News & World Report ranking of best public national universities—the highest U.S. News ranking in UGA’s history—and also earned the university a No. 12 national ranking in Kiplinger’s list of best values in public colleges. The university’s career outcomes rate is at a record level as well, with 96 percent of students either employed or enrolled in graduate school within six months of graduation.